In the waste paper processing process, a large amount of tailings will be generated. It is a pity that these tailings are discarded and recycling is difficult. The Reject Separator is specially designed to handle the tailings of equipment such as pressure screens, etc. It can effectively separate fibers and impurities, and make the fiber recovery rate reach 70%, reducing fiber loss. 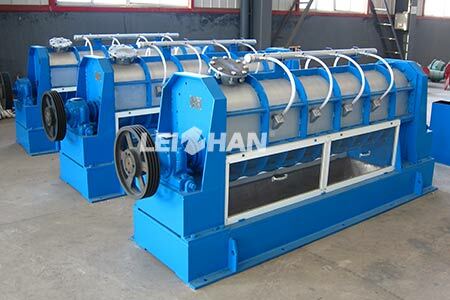 The Reject Separator is operated under normal pressure and continuously slag-free. There is no paste sieving, plugging and slurry splash phenomenon, no vibration and noise, and no special person is required to take care of it. The concentration of separated impurities can reach 10%-15%, which can be directly discarded as waste without treatment. The Reject Separator is currently a more advanced tailings processing equipment. Compared with the pressure type tailings screen, it can simplify the system process and save power consumption. Compared with the vibrating box flat screen, the Reject Separator can greatly improve the sorting efficiency and optimize the operating environment.